Does anyone else feel like this month is flying by?! Today my daughters received an email invitation for a friend’s birthday party, which is taking place on the same day as their 5th birthday party. And guess what? I hadn’t sent out the invites to their party yet! I went into a tailspin trying to get it together lest my children’s friends are all already booked up and can’t attend. Thankfully some friends already responded so I can breathe a sigh of relief, but it’s just one example of how nutty this time of year is and I am sure many of you can relate! Ok, so that had nothing to do with nutrition or food, but just a glimpse into my crazy life right now. Now we can move on to more interesting things like this week’s Link Love, which includes some great articles to help you get through this hectic and food-filled holiday season (clearly I need to re-read the “me-time” post below!) and recipes you don’t want to miss. 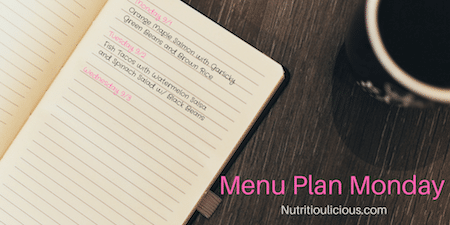 Check them out below followed by this week’s lunch and dinner menu plan. Hope you all have a great – and not too chaotic – week! ⇒ During this hectic time of year it’s important to remember to practice self-care, and it’s a great goal for going into the New Year as well. ⇒ The holidays are no time to diet, so sit back, relax and enjoy all the holiday delights with these 7 tips. ⇒ Jill always has the best advice when it comes to feeding kids and I couldn’t agree more with the rules she shares in this post. Pomegranate Vinaigrette @ Joy. Food. Sunshine. ⇒ You know I love pomegranates and all their health benefits and pomegranate dressing. Love the addition of maple syrup in this one. ⇒ I am amazed at how easy it is to use homemade ricotta! I need to give it a try myself and then make my Ricotta Berry Oatmeal Cups using it! ⇒ Potato latkes, aka pancakes, are a staple Jewish food at Hanukkah. I for one have never been a latke fan, but this healthier makeover using cauliflower is totally up my alley! ⇒ Another great recipe using those delicious pop-in-your-mouth pomegranate seeds! I think this is another appetizer for the New Year’s party list! December is totally flying by and like it’s been for you, pretty crazy for me too! Hopefully we can take a little break to enjoy our upcoming birthdays 🙂 Any special plans? I know Pete’s been planning something but so far he’s keeping it a secret. Enjoy all of your yummy meals this week. Thanks for the love! I can’t wait to hear what Pete’s planning for your birthday! I hope you have a fantastic celebration – wish we could cheers to our birthdays together! I have a big birthday this year (35!) so Andy is making me a party. Was supposed to have a 30th bday party, but then I was 8 months pregnant with the girls so we postponed it. Hope you have a great week Sonali! 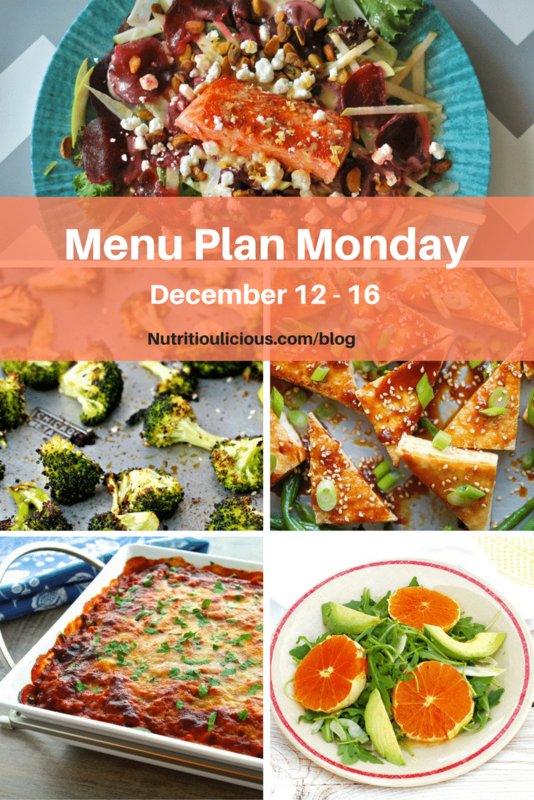 I always love these meal plan posts and thank you so much for including one of my recipes. Hope you have a great week full of great food! Thanks Brynn. I’m so glad to know that these menu plan posts are useful to people! Hope you’ve been having a great week as well!